Maid de Camera, a cool iPhone application works perfectly with the integration of iPhone’s camera. 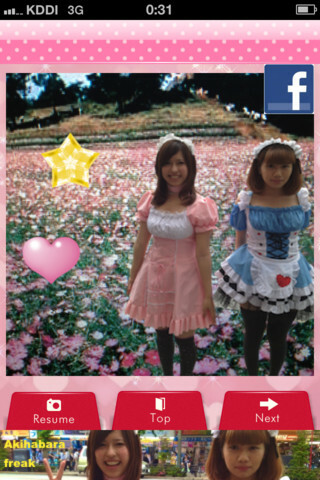 Imagex has created this application for all those who love to take snaps with cute Japanese Maids.The idea behind the application is most people will hesitate to request Maids for taking a snap, that too if they are pretty everybody would love to take a snap with them but they won’t have the guts to approach the Maids. But this application vanishes that hesitation. Yes, this application comes with a set of high definition templates where you can choose your favorite Japanese maid out of the list and you can take a cute snap with them in any location you like. Akihabara is a place which is mainly famous for most of the Anime and comic writers and it’s also famous for this cute Maid culture. The Restaurants in this place hire good looking cute Maids and make them dress up in their unique culture. The motto behind this application must be to spread this kawaii and Akihabara culture all over the world. This application has a very good layout in pink color which is a favorite color of most girls. This application comes with 20 Akihabara Maid frames with each frame has unique pose from different Maids. It also comes with 50 stamps which you can add to your photo to make your photography more decorative. Usage of this application is very simple and easy. All you need to do is tap on the lock button to unlock the frames and then select you favorite maid frame. Once you have selected your cute Maid, now you will see a button named camera. Just click the camera button, your iPhone camera will be preloaded with a Maid standing before you. Next you need to select a background and fit a person next to the cute Maid. You are all set now and once you are satisfied with the pose, go ahead and save the photo. Your photo will be available in your iPhone photos and if you have enabled iCloud feature it will be automatically moved to your cloud photo stream and shared among your devices. The application itself has an info button which gives you a simple pictorial tutorial of how to use this application. More than anything Imagex is working on providing many more Maid templates to their customers.This application has few cons which can be improved, likefew alert boxes are popped up in Japanese language when we cancel any photo. Instead of Japanese language if that is popped up in English, then this application will become more popular worldwide. Another upgrade that can be considered for next versions is it can be extended to the use of Front camera in this application. This application works perfectly with the rear camera, if this application is designed to switch between front & rear camera, it will become more popular.